Wayne Rooney’s making headlines again. This time though, it’s in relation to football – well soccer if you’re a DC United fan – and not his personal life! It wasn’t so long ago when Rooney was gracing pitches up and down the country in the Premier League but after his short spell at Everton he made the switch to the US. Following in the footsteps of David Beckham, Frank Lampard, Ashley Cole and Bradley Wright-Phillips, Rooney headed for the ‘Land of the Free’, signing for DC United in June. It was thought to be a bit of an odd decision at the time, especially as DC United are regarded as one of the worst teams in the MLS. They’ve fallen on tough times as of late, despite being a bit of a superpower between 1996 and 2004, where they won four MLS cups. On Saturday night, (July 28), United won for just the second time since May 19, beating Colorado Rapids 2-1. 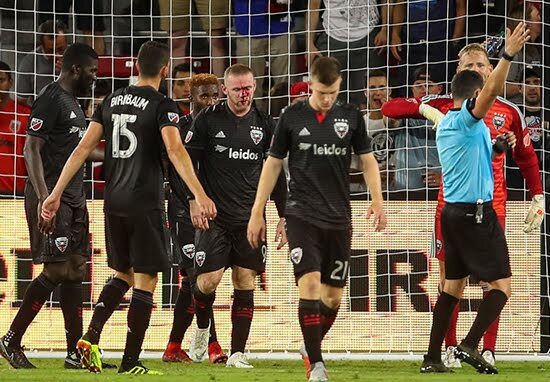 Rooney scored his first goal for his new team in their 2-1 win at the Audi Field. Rooney gave his side the lead on the 33-minute mark, after running onto a pass from Luciano Acosta, before slipping the ball between the legs of his former Manchester United teammate, Tim Howard. However, his momentous night wasn’t done with just yet. With United seeing out the game having re-established their lead, thanks to an own goal from Niki Jackson, the former England captain suffered a broken nose when defending a corner. Despite Rooney leaving the pitch with blood spurting from his face, the 32-year-old’s manager, Ben Olsen, played down the injury. I don’t think it’s the first time he’s bled in a game. He is a tough guy and I think that he will shake it off. He has been fantastic in every aspect, in every way that we want him to be with this group – with his leadership and goal-scoring ability. Hopefully, it can continue to get better. Despite DC United’s win last night, they remain bottom of MLS’s Eastern Conference.